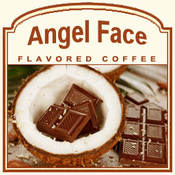 Angel Face is a delicately flavored coffee with sweet, tropical coconut flavors mixed with silky, smooth Swiss chocolate. This perfect collaboration of flavors will fill your favorite coffee mug with a sweet sensation of scrumptiousness. Made with 100% Arabica beans, this flavored coffee will hit the spot with its 2 calorie cup of flavor. This heat-sealed valve bag will ensure the freshest coffee possible especially since this Angel Face will be roasted and shipped on the same day. Indulge in this Angel Face coffee creation and satisfy your taste buds with this chocolate-coconut sweetness!